Chateau Fargueirol has one of the longest histories in the Southern Rhone Valley. Or perhaps it is better to say that the Revoltier family dates back to 1340. The Revoltier family held the property in those days, but left the area, after the Revolution. The Revoltier family did not come back to the region until 1974, when Joseph Revoltier purchased 10 hectares of land that needed to be completely re-cultivated, as the vines were left untended for years. The estate takes its name from its geographical location where their vines are planted in the Fargueirol lieu-dit. Due to additional purchases, Chateau Fargueirol was able to enhance their holdings to its current 30 hectare size. Today, Chateau Fargueirol continues as a family run vineyard, as the estate is managed by Pierre Revoltier, the son of Joseph Revoltier. Roman Revoltier, the son of Pierre Revoltier is next in line to take over the property. Chateau Fargueirol owns 30 hectares of vines in the far north of the Chateauneuf du Pape appellation. 29 hectares are used for red wine grapes, while 1 hectare is reserved for white wine grapes. On average, the vines are 50 years of age. Depending on the vintage and specific wine, the grapes are only partially destemmed. Vinification takes place in concrete vats and cement tanks. Chateau Fargueirol produces 3 red Chateauneuf du Pape wines and 1 Chateauneuf du Pape Blanc wine. Chateau Fargueirol Chateauneuf du Pape is produced from a blend of 70% Grenache, 20% Syrah, 5% Mourvedre and 5% Cinsault. The terroir is all rocks and stone soils. 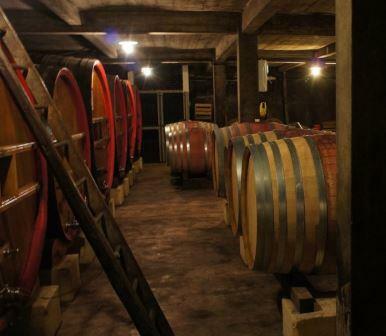 The wine is aged in mostly foudres, with 25% of the wine being aged in tank for 9 months before bottling. Chateau Fargueirol Cuvee Antonin is made from 100% old vine Grenache. The terroir is 100% small galets in the Farguerol lieu-dit. The wine is aged in demi-muids for 12 months before bottling. Chateau Fargueirol Cuvee Jean XXII is mostly Grenache, with various amounts of all the allowable, red wine grape varieties. Chateau Fargueirol Chateauneuf du Pape Blanc is made from a blend of 45% Clairette, 35% Roussanne and 20% Grenache Blanc. The wine is aged for 6 months in French oak barrels before bottling. Chateau Fargueirol Reserve des Seigneurs is no longer in production. Chateau Fargueirol also produces red and white wine from 9.5 hectares of vines they own in the Cotes du Rhone appellation. Chateau Fargueirol can be enjoyed on the young side. Young vintages can be popped and poured, or decanted for about 1 hour, give or take. This allows the wine to soften and open its perfume. Older vintages might need very little decanting, just enough to remove the sediment. Chateau Fargueirol is usually better with 2-4 years of bottle age. Of course that can vary slightly, depending on the vintage. In the best vintages the wine should be consumed within 4-15 years after the vintage. Chateau Fargueirol is best served at 15.5 degrees Celsius, 60 degrees Fahrenheit. The cool, almost cellar temperature gives the wine more freshness and lift. Chateau Fargueirol is best served with all types of classic meat dishes, veal, pork, beef, lamb, duck, game, roast chicken, roasted, braised, stewed dishes, barbecue, sausage and cassoulet. Chateau Fargueirol is also good with Asian dishes, hearty fish courses like tuna, mushrooms pasta, eggplant, tomatoes and cheese. The white wine of Chateau Fargueirol is best served with a myriad of different seafood dishes, shellfish, crab, lobster, sushi, sashimi, chicken, pork and veal, as well as Asian cuisine. Soft, sweet, elegant and fresh, the, red, silky textured fruits are and bright and clean. Medium bodied, and crisp, it's the sweet note of kirsch in the end that saves the day. Medium bodied, elegant, fresh, with red berries, thyme and peppery spice from start to finish. Round, forward, medium bodied and still a bit oaky, the fruit is ripe and juicy, but it's going to need time for the oak to integrate. Medium bodied, lushly textured, with an elegant shot of sweet, fresh kirsch and licorice. You can drink this now.